Don and Phil Everly had the right combination of talent, material and timing to become superstars. The corporate backing to give them their best shot was there too, as long as they were willing to make compromises. That last part wasn't always easy for the young singers, but that's how it usually works in the record business, or any business. In their case things went well when someone older and (not necessarily) wiser was in control, yet success was elusive when the two were left to their own devices. 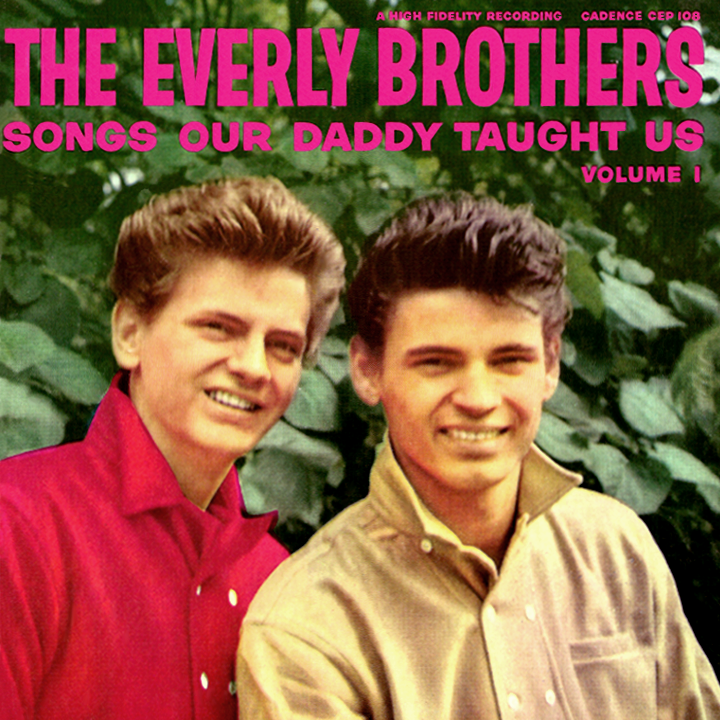 Either way the music of The Everly Brothers is outstanding. At the start it was their father, Ike Everly, who called the shots. Ike was a singer and guitarist who performed on radio stations throughout the south and midwest. Lots of them. It was a way to make a living performing country and folk music at a time when it seemed every town had at least one station that welcomed live musicians. In the 1930s and '40s, Ike and his wife Margaret passed through many such towns for stays of a few months, or a few years. First child Don was born in Brownie, a small Kentucky town, in 1937. Two years later, Phil was born in Chicago. Around 1945, Ike worked for a station in Shenandoah, Iowa, and began to feature the boys (ages eight and six) on his show. In the early 1950s the family act spent some time in Evansville, Indiana, then in Knoxville, Tennessee. By their teens, Don and Phil had evolved into fine musicians and singers, studying the harmony style of The Delmore Brothers (best known for the huge 1949 country hit "Blues Stay Away From Me") and writing songs, which would give them their first taste of success. A move to Nashville in 1954 brought the boys to the attention of Chet Atkins, already a recording artist and longtime star on the Grand Ole Opry. He arranged for them to meet Wesley Rose of Acuff-Rose Publishers; they signed with the company and hired Rose as their manager. At the end of the year, Don's composition of "Thou Shalt Not Steal" was a hit for Kitty Wells, the biggest female country singer of the entire decade. A national hit in a matter of months led to an opportunity to make their own records, but it took about a year before Columbia Records was willing to give them a chance. 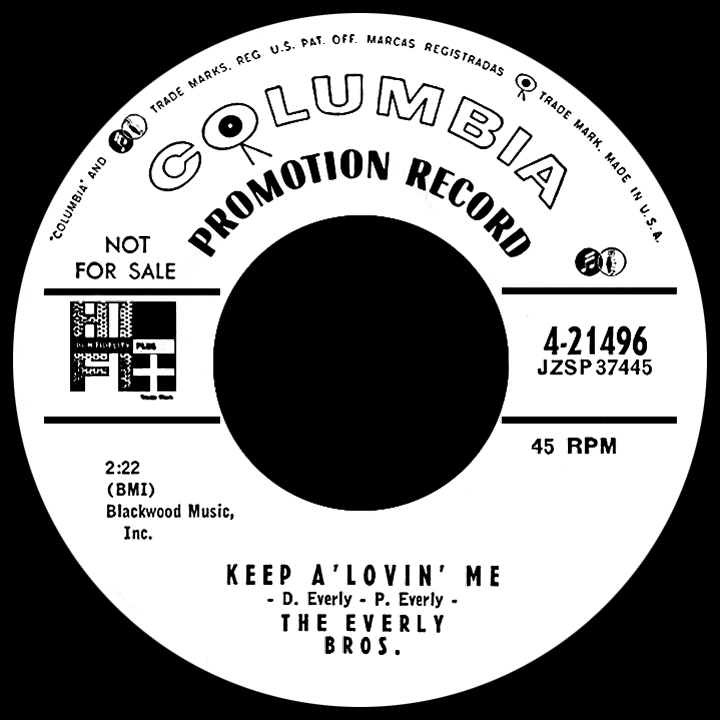 "Keep A'Lovin' Me," written by the brothers, was released in the spring of 1956 and targeted strictly to the country market, where it was ignored. The Louvin Brothers were hot at the time with "I Don't Believe You've Met My Baby" and apparently Columbia wasn't sure there was room in country music for two brother acts. They weren't given a chance to make a second single. On the artistic side, Atkins believed the teenage brothers had talent and potential. On the business side, Rose felt he could make a lot of money with them. Cadence Records owner Archie Bleyer had already realized that combining standard pop music with a teenage sensibility could result in big hit records (he had inadvertently stumbled onto a formula just a bit ahead of its time with The Chordettes' number one hit "Mr. Sandman" a couple of years earlier). Signed to the Cadence label in 1957, Bleyer set them up with wife-and-husband songwriters Felice and Boudleaux Bryant. The combination of Bleyer plus Bryant plus Everly under the recently-established reign of King Elvis resulted in Don and Phil becoming one of the biggest acts in rock and roll. The first release was "Bye Bye Love"...you know that one by heart, don't you? 'Bye bye love, bye bye happiness, hello loneliness, I think I'm a-goin' to cry.' It was an instant summer '57 number two smash, blocked from the top spot on Billboard by Pat Boone's career-peaking "Love Letters in the Sand," then leapfrogged by the unstoppable Elvis Presley's "Teddy Bear" (on the Cash Box charts it managed to squeeze in a week at number one). 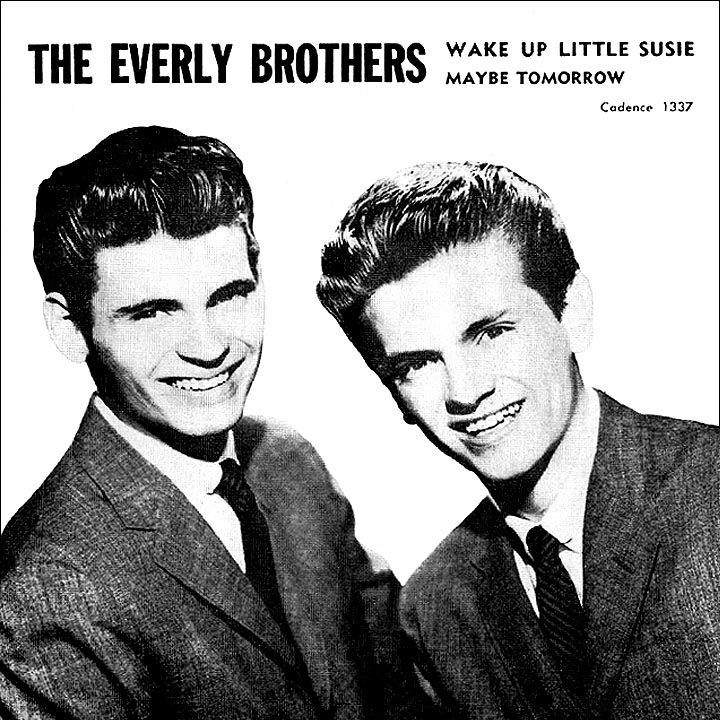 The Bryants devised a scandalous 'ooo-la-la' scenario for the second single: in "Wake Up Little Susie" the ramifications of falling asleep in a movie theater were addressed ('we fell asleep, our goose is cooked, out reputation is shot') and in October the brothers had the number one hit in America. Then the problems set in. You'd think that with two million-selling singles they could do whatever they wanted, right? So they did...the third single was a remake of one of Don and Phil's favorite Ray Charles songs, "This Little Girl of Mine." Wesley Rose had a fit! It was against every fiber of his businesslike being to hand over royalties to someone not in the Acuff-Rose stable of songwriters. The reasons why this terrific track was only a lower top 40 hit are anyone's guess, but it's been suggested that Rose did everything in his power to suppress the record, in spite of Bleyer's promotional push. The fourth Cadence single, Boudleaux Bryant's "All I Have To Do is Dream," came without any inner discord to work against it. 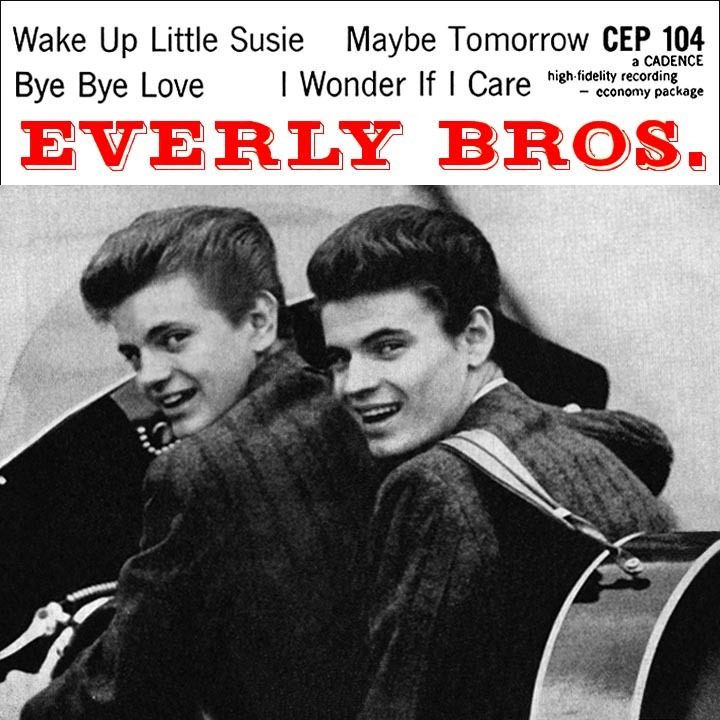 The Everlys were back at number one in May and June 1958; "Dream" was one the biggest hits of the 1950s, a standard that would be recorded by many artists in the years to come. In addition, the song pulled off the rare feat of hitting number one on the best seller charts in pop, country and R&B, a Triple Crown of sorts in the recording industry (so rare, in fact, that Elvis is the only other artist to accomplish it). This time the flip side was a rockin' Roy Orbison song, "Claudette" (though not by the Bryants, it nevertheless came from the Acuff-Rose catalog, so Wesley Rose had no objections). 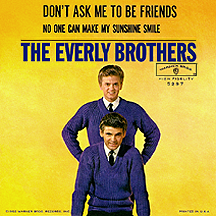 For all the efforts of Don and Phil to put their stamp on material from outside sources, the songs by the Bryants were, quite simply, perfect for them, custom-made for the duo's harmony style, with relatable themes that were surefire hits with the young fans who bought records en masse. The next single fit right in with the concept: we can all recall an apple-polishing teacher's pet like that "Bird Dog" ('he even made the teacher let him sit next to my baby! '), another number one hit, August '58. The flip, "Devoted to You," hit the top ten in its own right. With the next single, "Problems," Felice and Boudleaux got inside the head of a teenager who doesn't always get his way; it hit number two in December. 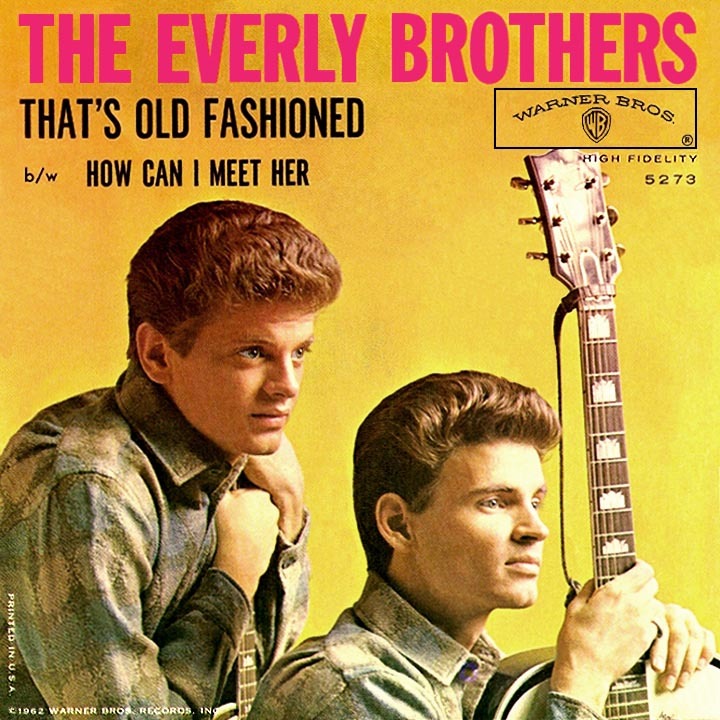 The Everly Brothers were as "big time" as it gets. Bleyer, Rose and the Bryants were making a fortune off them. 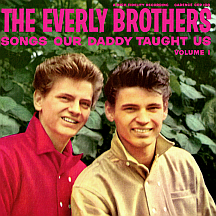 The boys themselves were major stars, in a league with Elvis himself. 1959 was a strong year, though not the caliber of the two previous. Felice and Boudleaux continued to stretch the boundaries of teenage experience ("Poor Jenny" does jail time!) 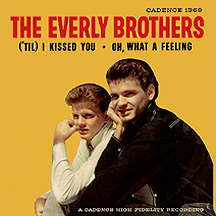 and Don composed his first Everly hit, "('Til) I Kissed You." 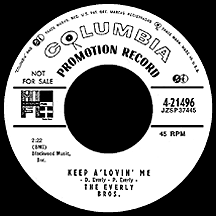 A French song, "Let It Be Me," written by Gilbert Becaud and Pierre Delanoe with English lyrics by Mann Curtis (previously a minor hit for Jill Corey in '57) got 1960 off to a hot start with the Everlys in the top ten. Bleyer, sensing a limited shelf life for the duo and rock and roll in general, decided to shop the brothers to other labels in the hopes of selling them off before they went cold. It was a shortsighted move, but understandable when considering the limited scope of many artists' careers and the feeling that they had passed their peak. The relatively young Warner Bros. Records (backed by the big bucks of the relatively old Warner Bros. film studio), in an effort to beef up their roster and compete with the big labels, bought the act's contract for a reported one million dollars (a bold move when compared to the 35 thousand Sam Phillips of Sun Records accepted from RCA Victor for Elvis's contract just four years earlier), giving them a ten-year deal in the process. It was a major risk, but it paid off for Warner and paved the way for the label's own record industry dominance in later years. The pressure was on to achieve a seamless transition. The big hits had to keep coming if WB was to protect its investment and ensure the future of the major studio's record arm. 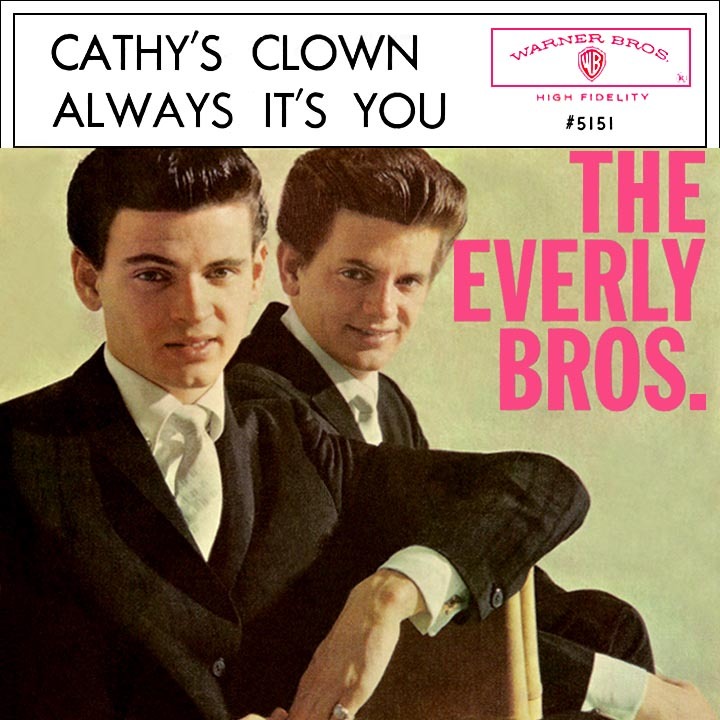 "Cathy's Clown," written by Don and Phil, was just the song to do it. Their fourth number one hit, it was the biggest of the bunch. Cadence continued to release singles by the duo as well, and Phil's "When Will I Be Loved" made the top ten in July, just as "Clown" was moving down. 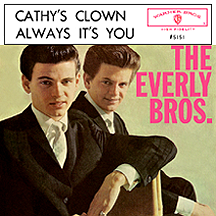 With both current and former labels putting out records, 1960 turned out to be the biggest year for the brothers. 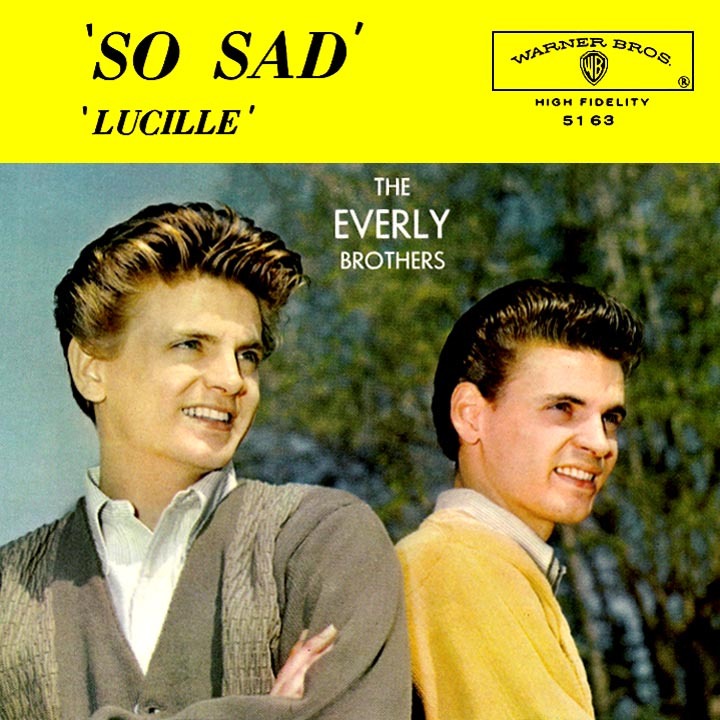 Eight songs hit the charts, with four going top ten, including the second Warner single "So Sad (To Watch Good Love Go Bad)," written by Don, with a creative remake of Little Richard's "Lucille" on the flip, experimenting successfully with a massive multiple-guitar sound. Despite the disapproval of Wesley Rose, the brothers were increasingly interested in contributions from writers outside the Acuff-Rose family. John D. Loudermilk's "Ebony Eyes," straight from the "death songs" well that everyone was dipping into at the time, was the next single. 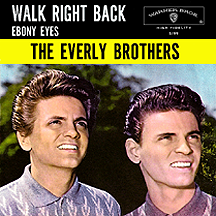 It hit the top ten while the flip side, "Walk Right Back" (penned by Sonny Curtis of The Crickets) was getting excessive airplay as well. 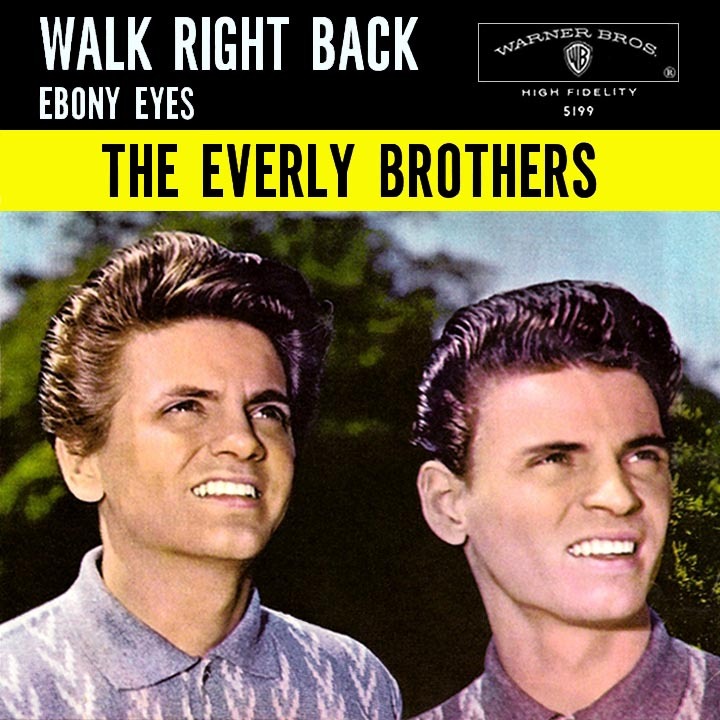 The two were side-by-side in the top ten the last week of March 1961. Three releases, four top tens! No one was mourning the move to Warner Brothers...except maybe Archie Bleyer. With the freedom given them by the new label came a certain reckless abandon. They figured they could make no wrong choices, though Rose was always there to try to keep them in check. "Temptation," a song by Nacio Herb Brown and Arthur Freed, introduced by Bing Crosby in the 1933 Raoul Walsh-directed musical Going Hollywood, was reworked by Don and Phil as a hard-pounding production number (featuring female backup singers for the first time on an Everly record). Rose strongly opposed its release, but by this time the brothers were less tolerant of his controlling demands about what material they could or could not record based strictly on potential profits. They fired him as their manager and he retaliated by cutting ties between all Acuff-Rose writers and the Everly Brothers. It meant they no longer had the brilliant songs of Felice and Boudleaux Bryant to lean on, yet they relished the idea of having complete control. The rub was that the two were still under contract to Acuff-Rose, so the publishing house continued to cash in on any hits they composed. For the next couple of years, Don and Phil indulged in a steady diet of music from outside writers. 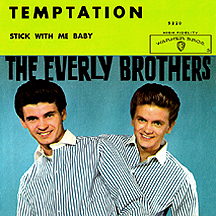 While "Temptation" was the first WB single to fall short of the top ten, it was a number one hit in England, where the brothers had been every bit as popular, from "Bye Bye Love" on, as they were in the States. This U.K. success would prove to be a blessing in the coming years. For the time being, they kept hitting big on the charts and enjoying their creative freedom. Don formed his own label, Calliope (a Warner subsidiary), and with the help of Ike Everly went to an unexpected place. Using the made-up name Adrian Kimberly, he recorded "Pomp and Circumstance" (Edward Elgar's 1901 march widely known as "The Graduation Song"), a high-school-band style instrumental mashup with a female chorus chanting the familiar 'no more pencils, no more books...no more teachers' dirty looks!' 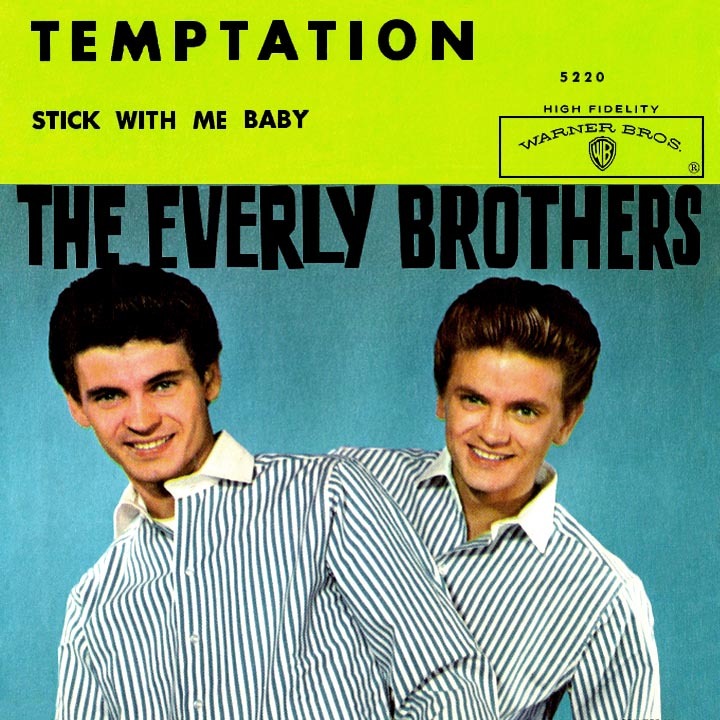 The single, timed for release at the end of the 1961 school year, hit the top 40, with few aware of its Everly connection. Don and Phil began studying to be actors around this time, but a screen test with Warner Bros. didn't go well and they abandoned the idea. Their only film and television appearances have been performances of their music. Another unforeseen turn came when they enlisted in the U.S. Marine Corps in November 1961. The brothers went in together under a special arrangement to train and serve a six month tour, followed by eight years of once-a-month reserve duty. The music career remained top priority, with singles coming out on a steady schedule. Sticking with vintage material, the next release was another song from 1933, "Don't Blame Me" (written by Jimmy McHugh and Dorothy Fields, it had been a top ten hit that year for two artists, Guy Lombardo and Ethel Waters). The record fell short of expectations; it was time to tackle something a bit more contemporary. Just for fun, a little songwriter-switch occurred one day among two Brill Building teams: Carole King paired up with Howard Greenfield and King's partner Gerry Goffin worked with Greenfield collaborator Jack Keller. This musical chairs (pun intended) exercise resulted in several songs The Everly Brothers ended up recording. The Greenfield-King song "Crying in the Rain" was a top ten hit and a Goffin-Keller tune, "How Can I Meet Her?," wound up on the flip side of the next single, "That's Old Fashioned" (the duo's 15th top ten hit in a five-year span). 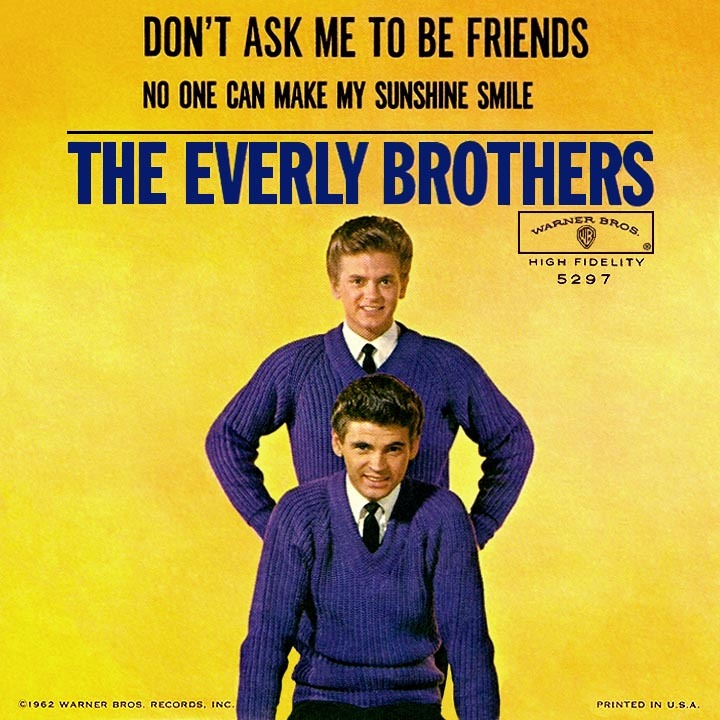 Other Goffin-Keller songs recorded by the Everlys included the next WB single, "Don't Ask Me to Be Friends" and its B-side, "No One Can Make My Sunshine Smile." The brothers, meanwhile, were supplying songs they had written to a number of artists. Archie Bleyer liked "(Girls, Girls, Girls) Made to Love," releasing a version by Eddie Hodges on Cadence that hit the top 20 in July 1962. The two went through a bout with drugs, though to what extent may never be common knowledge. During a 1962 European tour, Don overdosed on sleeping pills; at least that was the official statement. Phil had to finish the tour by himself. Other instances were reported with both brothers before they presumably got things under control. 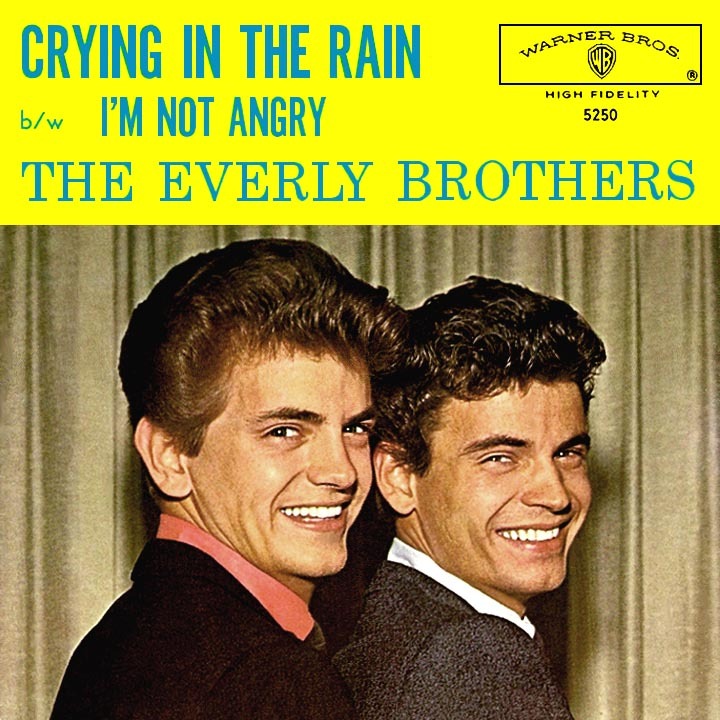 Combined earnings for the brothers has been estimated in the tens of millions, including income derived from sales of the Everly Brothers Flattop, an acoustic guitar produced by Gibson and based on the design of the Gibson J-200, their guitar of preference since the '50s. A return to England in October 1963 had them headlining a show that included Little Richard, Bo Diddley and opening act The Rolling Stones (whose only hit in the U.K. to that time had been a cover of Chuck Berry's "Come On"). They had a frustrating go of it in 1963, releasing several singles, then standing by as all of them fell short of the national charts. Things got better in '64; they patched things up with Acuff-Rose, began working with the Bryants again and returned to the top 40 with "Gone, Gone, Gone," a song they wrote together that ranks among their best. Chart hits kept coming regularly in the U.K., with "The Price of Love" a highlight, hitting number two in June 1965, nestled in a familiar spot behind Elvis Presley's 15th number one hit in England, "Crying in the Chapel." 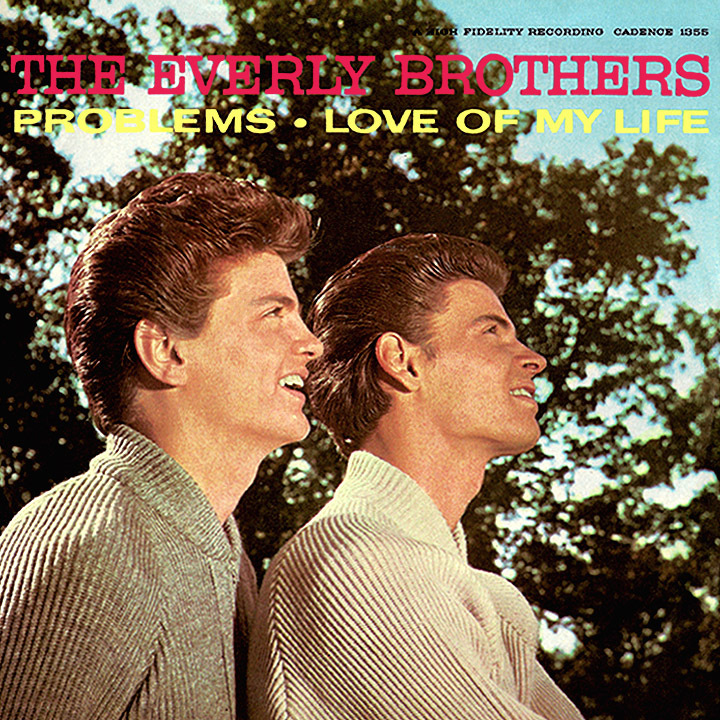 A remake of Mickey and Sylvia's 1957 classic "Love is Strange" was also big there during another stretch when every single release in the U.S. fell short of the charts. They had been an inspiration for countless British bands since the first hits in 1957, including The Beatles and The Hollies, as well as American folk-rockers Simon and Garfunkel. It was the Hollies, in fact, who patterned their entire sound on the Everlys, and the brothers gave them the ultimate thank-you note with a 1966 album, Two Yanks in England, featuring no less than eight songs by the band's songwriting team of Tony Hicks, Allan Clarke and Graham Nash. 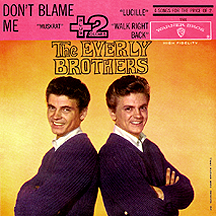 The brothers regained the spotlight briefly in 1967. The Don Everly song "It's All Over" was a top ten U.K. hit for Cliff Richard in the spring; in America it was covered by The Casinos. Then Don and Phil released "Bowling Green," written by Terry Slater, working as the duo's bass player at the time; a throwback to their Kentucky roots, it became thei final top 40 hit in July. Warner Bros. kept its end of the deal and records were recorded and released until the ten year contract was fulfilled in 1970. 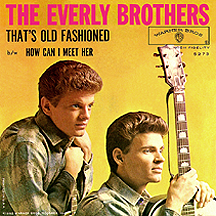 They had increased exposure that year, though, with their own ABC-TV variety series, The Everly Brothers Show, a summer replacement for The Johnny Cash Show. A who's who of pop, rock, R&B and country acts were guests on the short-lived series, including Cash (on the first installment), Marty Robbins, Jackie DeShannon, Neil Diamond, B.J. Thomas, Ike and Tina Turner and The Statler Brothers. RCA Victor signed The Everly Brothers to a contract in 1971, but without any notable success they were dropped in '73. The inevitable breakup was an amicable one, and for the next ten years they each made solo recordings for a number of different labels. A reunion in 1983 put them back on the charts with a minor hit on the Mercury label. Paul McCartney, ever the Everly fan, wrote "On the Wings of a Nightingale," and Dave Edmunds produced the record. The single and accompanying video (it was the era of MTV, after all) made a splash in the fall of 1984.